Apple New Smart Pixel Patented For Future Apple Devices display technology is becoming better day by day many display manufactures like LG, Sony or Samsung already made some significant move in this market which help them to make leap forward and provide display to other brands. While Apple has recently trying to make their own micro LED-based display technology which Apple could use in future iPhones, MacBooks, iMacs and future Apple products. Apple has recently published a patent regarding currently developing display tech which could be commercially use in wearables devices like AR/VR headsets within the next two to three years. While other devices like iPhone, Macs and other could use this display in later future. Apple filed this patent in 2nd quarter of this year but published by the U.S. Patent and Trademark Office on Thursday, details various embodiments in which traditional thin film transistor (TFT) backplanes (the driving component of current LED-based active matrix displays) could be replaced by a series of ‘Smart Pixel’ microcontrollers, which can add new functionality not previously possible using current TFTs. While upcoming iPhone flagship could feature OLED display technology, while according to experts micro-LED could give one to one with OLED technology and Apple could swipe OLED panel to micro-LED in future. According to Lee Biing-jye, chairman of Taiwanese LED epitaxial wafer and chip maker, Epistar, “Micro LED technology could be used in smaller, wearable devices like smartwatches in three years,” which would coincide with reports that Apple is looking into ways of incorporating Micro LED display tech in an upcoming variant of the Apple Watch. Specifically, the report says that “Apple is inclined to adopt Micro LED technology for small- to medium-size displays,” while other international consumer electronics vendors like Samsung Electronics, for example, plan to apply the technology in its next-generation of big screen TVs. So it very important to see how Apple could introduce this technology, and which device will get benefit from Apple new display technology. 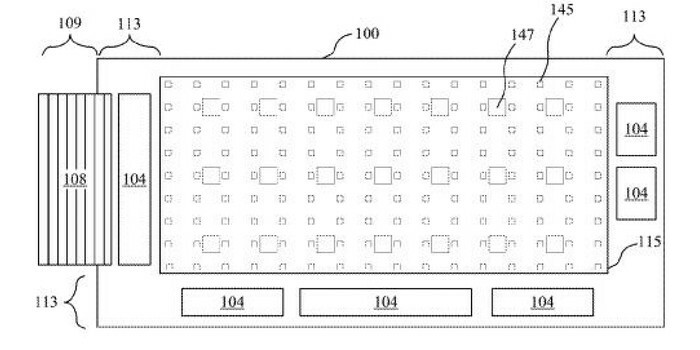 Apple describe this patent as “Smart Pixel” technology this could mean that new display will have individual pixel control. New Display could use less power so battery of iPhone will become more better than ever.